Colgate case studies: we currently have 3. To promote the innovative new Colgate Optic White Express White toothpaste, Colgate-Palmolive put YouTube at the core of its integrated media and creative campaigns. By overhauling its marketing strategy and investing more heavily in digital, Colgate scored big and "will never look back." 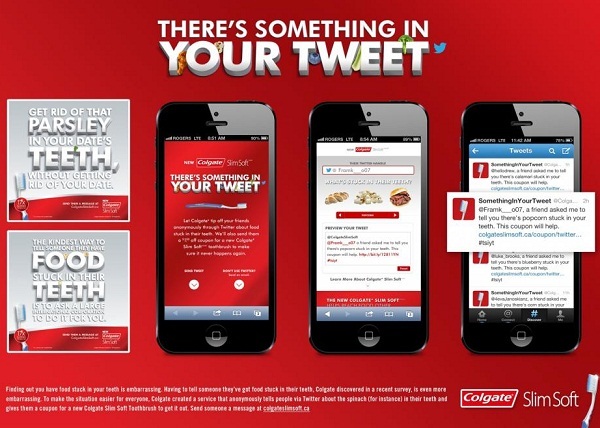 In the summer of 2013, Colgate launched Twitter campaign ‘There's Something in Your Tweet', helping people alert people that they have food stuck in their teeth. The Canada-based campaign was created by Union Toronto, letting people send an anonymous alert via Twitter, or if they want to keep it private then they can send a quick email. Colgate ran their advertising campaign in print, television and online. The results showed that it cost 23% more to encourage consumer purchase using TV alone compared to using TV in combination with online. For their multichannel campaign, reallocating marketing dollars to online advertising was significantly more cost-effective at driving purchase intent and enhancing key branding metrics. Simply by allocating 7% of media dollars to online, purchase intent increased 3.8%.